From the land of the great ancient Egyptian civilization, the land visited by Our Lord and the Holy Family, and from the line of renowned predecessors such as St. Mark the Apostle, St. Athanasius the Apostolic, and St. Cyril the Great, comes the author of the renaissance of the Coptic Orthodox Church: H. H. Pope Shenouda III. A distinguished and prominent religious leader, a profound theologian, a gifted preacher, a talented author, a spiritual father, a man of God his entire life. His Holiness was born Nazeer Gayed on August 3, 1923, to a pious Christian family in Egypt. By the age of 16, H. H. was active in the Sunday School movement, which wrought to enrich Christian Education in the Coptic Orthodox Church. When H. H. graduated from Cairo University, he joined the Coptic Orthodox Seminary, and upon graduation, joined the faculty of the seminary. On July 18, 1954, H. H. chose the solitude of the Egyptian desert and the angelic life of monasticism over everything else, taking the example of St. Anthony the Great. As a monk, and later a monk priest, H. H. carried the name of the Christian monk and was know as Fr. Antonious El-Syriani. Wishing to live in complete solitude and devotion to our Lord, he became a hermit and lived in a cave that he had carved out himself for a period of six years. On September 30, 1962, he was called by the late Pope Cyril VI to be consecrated Bishop of Christian Education and President of the Coptic Orthodox Theological Seminary. He was known as His Grace Bishop Shenouda. Through his leadership of the seminary, the number of students tripled. On November 14, 1971, His Grace Bishop Shenouda was consecrated as His Holiness Pope Shenouda III, the 117th Pope of Alexandria and Patriarch of the See of St. Mark. 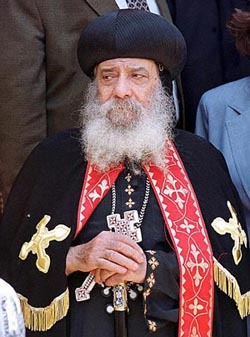 Since that blessed day, the Coptic Orthodox Church has witnessed a remarkable revival through the guidance of the Holy Spirit and the pastoral care of H. H. Pope Shenouda III. H. H. conducts a weekly meeting, which is attended by over seven thousand of the faithful at the Cathedral of St. Mark in Cairo. H. H has been the editor-in-chief of El-Keraza Magazine, the official publication of the Coptic Orthodox Church, since 1962. He became the first patriarch of Alexandria since the Fifth Century to have been Dean of the Theological Seminary and continues to lecture at the branches of the Seminary in Cairo, Alexandria, and abroad and the Higher Institute of Coptic Studies. He also established other branches of the Seminary in Egypt as well as in America, Australia, and the United Kingdom. His Holiness is the author of 101 books on a variety of subjects, over half of which have been translated into English, French, German, Italian, and other languages. Despite his many responsibilities, H. H. usually manages to spend three days a week in the monastery. His love of monasticism has led a monastic revival in the Coptic Orthodox Church. He has ordained hundreds of monks and nuns and reestablished many monasteries and convents. He is the first pope to establish Coptic monasteries outside of Egypt, which presently number nine. One of the most remarkable things about the growth of the Coptic Orthodox Church is her expansion worldwide. When H. H. became pope in 1971, there were only four churches in North America. Today, there are over 100. The year 1996 witnessed the installation of the fist two Diocesan bishops for the United States, one for Los Angeles and the other for the Southern United States. There are plans to further group the churches into regional dioceses in the near future. H. H. has established mission churches in the U. S. Virgin Islands in St. Thomas, Bermuda, and St. Kitts. Moreover, he founded the first Coptic Orthodox Church in South America in Sao Paolo, Brazil, and the second in Bolivia. Under his leadership, the Coptic Orthodox Church has also witnessed a growth in Australia and New Zealand, where there are currently twenty-eight churches. In 1999, we witnessed the enthronement of the first bishop over Melbourne, Australia and New Zealand. In Europe, there are currently over fifty church and ten bishops. Africa currently has two bishops serving in missions in nine African countries. H. H. has emphasized that Christian Unity must be found upon a unity of faith and not a unity of jurisdiction. As a result, H. H. has paid many visits to the various sister Orthodox churches and their patriarchs, such as those of Constantinople, Moscow, Romania, and Antioch. A full communion of these churches with the Oriental Orthodox Churches is very close. In 1973, H. H. was the first Coptic Orthodox pope to visit the Vatican in over 1500 years. In this visit, both H. H. Pope Shenouda III and H. H. Pope Paul VI signed a common declaration on the issue of Christology and agreed to establish joint commissions for dialogue on unity. There have also been dialogues with various Protestant churches worldwide. Under the leadership of H. H., the Coptic Orthodox Church is a full member of the World Council of Churches, the Middle East Council of Church, the All-African Council of Churches, the National Council of the Churches in Christ in the U.S.A., the Canadian Council of Churches, and the Australian Council of Churches. In May 2000, he established the first ecumenical office, in the Archdiocese of North America. --Biography from St. Mark's Church of Cleveland, Ohio.